We will also be hosting four family teas – a chance for the Church family to come together and enjoy fellowship over a buffet meal. These will be held at 5.30pm to make them more accessible for those with young children. During November and December we will also be running a Discipleship Explored course for adults alongside a Alpha Youth course for our younger people. 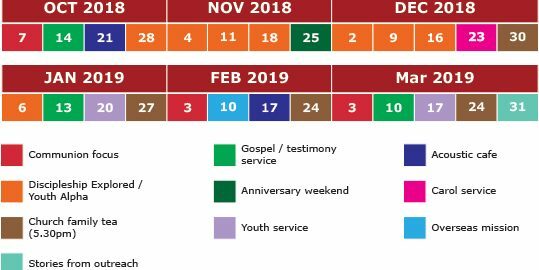 Leaflets featuring the schedule from October 2018 – March 2019 will be available from the Church. Please pass these on to anyone you think might be interested.